The University of Lagos, over the years, has experienced a growing trend which has resulted in a significant increase in the number of outdoor students’ activities that take place within the campus which include trade fairs, outdoor seminars, exhibitions and social events. The trend is the attraction of students to commercial products that are brought in by numerous industries trying to take advantage of the students’ population to market and exhibit their products. Companies ranging from telecoms and information technology to simple retail products have taken this advantage and the growing trend to boost their product sales and introduce new products to the market. The resulting effect on the University learning environment has been quite immense; Gardens are frequently filled with pop-up stores and transformed into exhibition grounds to capture students’ attention on their way to or from lecture halls and their hostels. The need for some companies to have information sessions, especially Information Technology companies, has also put a significant amount of pressure on the already inadequate lecture halls. The Unilag Campus Hub is an innovative, dynamic structure that harmonises these activities while taking into consideration the other function existing on the chosen site. The location plays a major role in influencing the flow of the functional space and the design program maximises its central location which is also the reason why the Students Affairs department is presently located on it. The design incorporates exhibition halls, an auditorium, retail stores; open exhibition spaces, café, bank and bookshop, and the Students Affairs department. The building plan is give form through spatial volumes attached to walls that converge toward an amphitheatre that provides a unique meeting space. Approaching the building from the main gate, the visitor enters the site going through large green lawns covered with steel sunshade that provides cover during long, sunny days. The lawns accommodate open exhibitions, pop-up stores during trade fairs and outdoor students’ activities. The auditorium is accessed through the side; it also connects to smaller lecture halls located on the upper level. At the end of the structure, in its previous location, is the Student affairs department which is uniquely situated under an amphitheatre which is provides a unique recreational space and interactive platform between the department and the students. 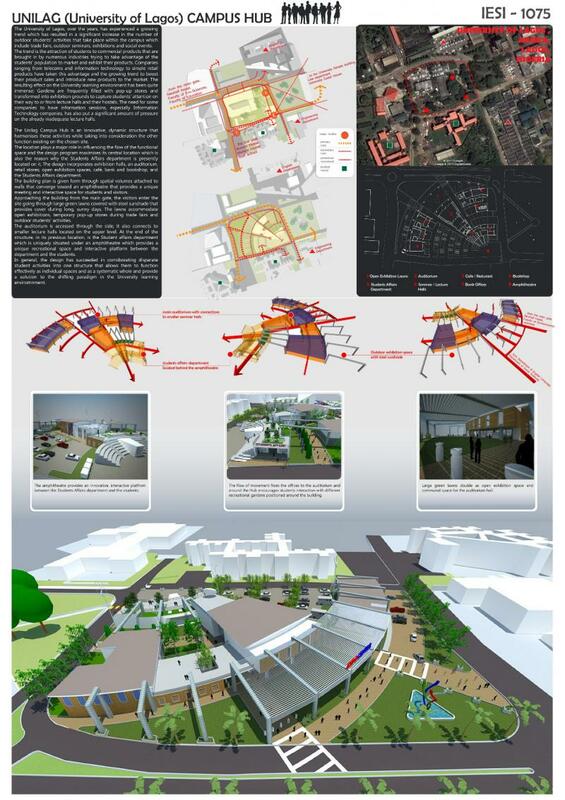 In general, the design has succeeded in corroborating disparate student activities into one structure that allows them to function effectively as individual spaces and as a systematic whole and provide a solution to the shifting paradigm in the University Learning environment.